Digsby for Mac is a instant messaging, email notification and social networking tool for Mac OS X. 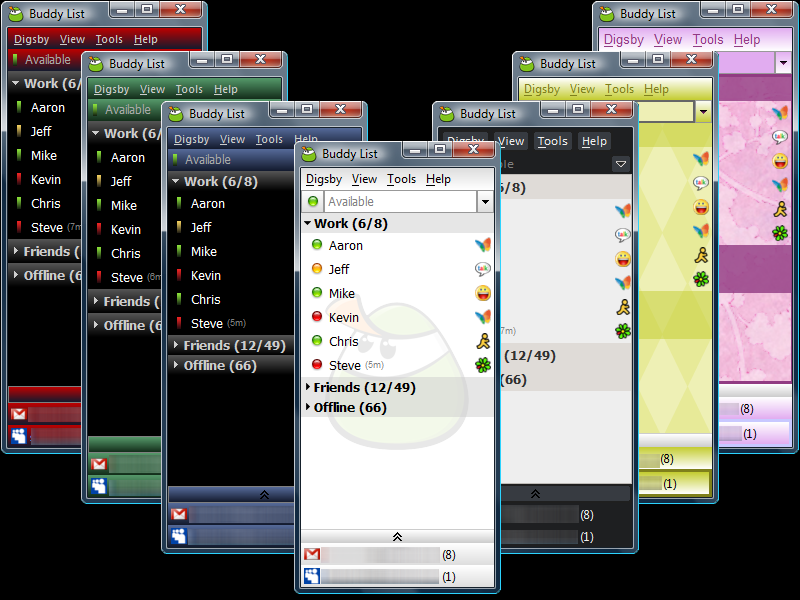 One combined buddy list for all your AIM, MSN, Yahoo, ICQ, Google Talk, Jabber, and Facebook Chat Accounts. Manage your Hotmail, Gmail, Yahoo Mail, AOL/AIM Mail, IMAP, and POP accounts right from digsby. Get popup notifications when new email arrives. Stay up to date with everything happening on your Facebook, Twitter, MySpace and LinkedIn accounts. * If one of your friends has more than one IM account you can combine them into a single merged contact to eliminate duplicate buddies. * Send your friends SMS messages right from the IM window. * The InfoBox lets you check everyone's status message and profile just by moving your mouse down the list. * Changing your status has never been easier. just one click right on the buddy list! * Multitask while you chat. Minimize the IM window and you see popups of new IM's. * Best of all, you can reply right from the popup and get back to what you were doing. * Log conversation history and find the information you need our search-enabled log viewer. * Manage your Hotmail, Gmail, Yahoo Mail, AOL/AIM Mail, IMAP, and POP accounts right from digsby. * Get popup notifications when new email arrives. Clicking a popup takes you right to the message with auto-login into webmail accounts. Qweas is providing links to Digsby for Mac 2010 as a courtesy, and makes no representations regarding Digsby for Mac or any other applications or any information related thereto. Any questions, complaints or claims regarding this application Digsby for Mac 2010 must be directed to the appropriate software vendor. You may click the publisher link of Digsby for Mac on the top of this page to get more details about the vendor.